Here at Chat Chow TV, we are serious about our cocktails. So serious in fact, that we decided to step up our cocktail-making game and make our own bitters, you know, just to show how dedicated we are. Once used for medicinal purposes, bitters were a necessity in drinks during the time of homemade moonshine and cheap booze, i.e. the late 19th century. Bitters helped make the cheap alcohol taste better and the booze made the bitters easier to drink. 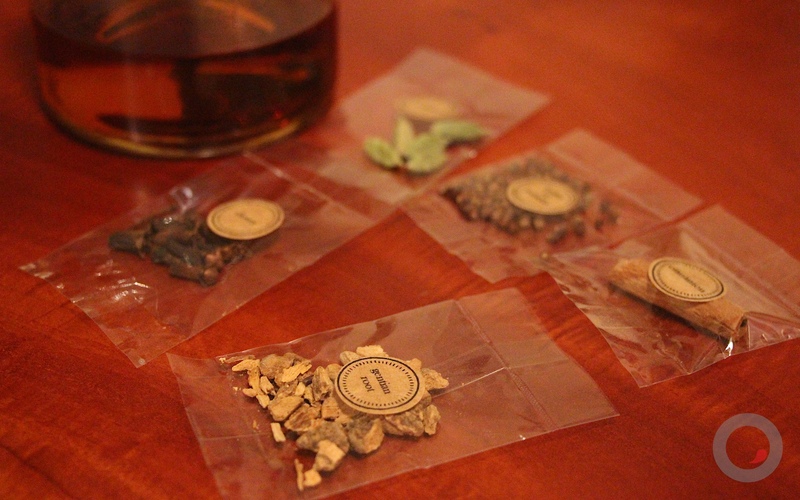 However, as alcohol improved in taste, bitters lost some of their appeal. 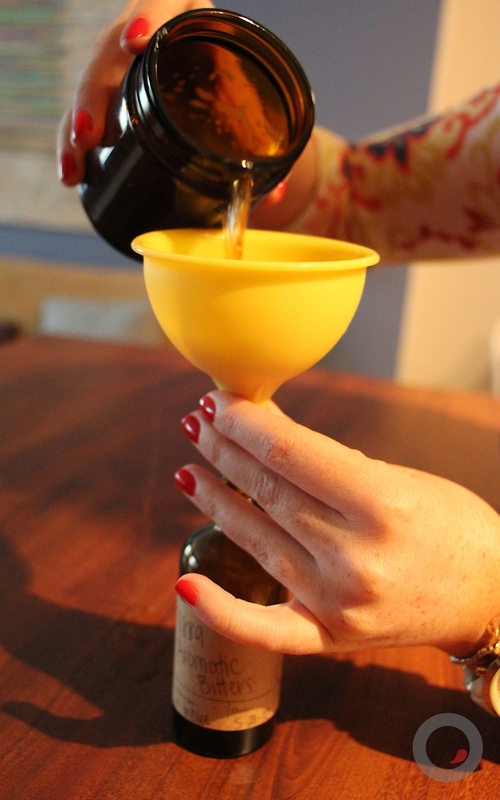 But bitters have made a comeback with the growing popularity of classic cocktails, which use them often. 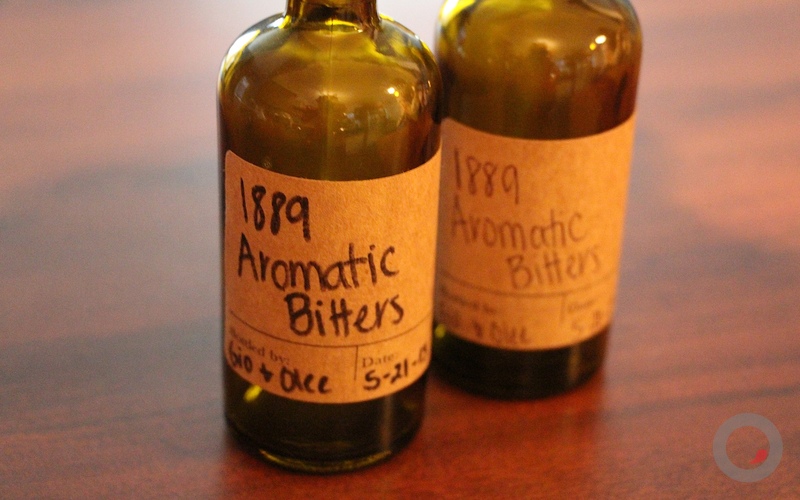 In order to make our own bitters, the kind folks over at Dash Bitters sent us their make-your-own 1889 Aromatic Bitters kit. 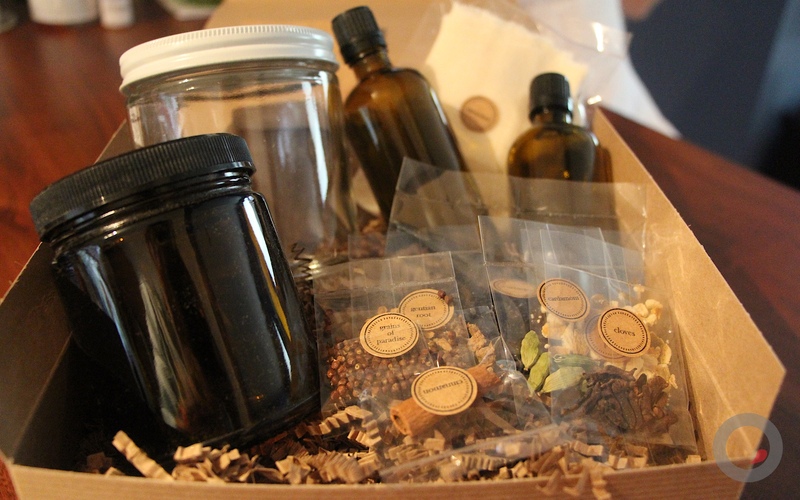 The kit included aromatics, cheesecloth, funnel, a clear infusion jar, an amber tincture jar, two bitters bottles and two labels. What it didn’t include was the over proof (100 percent or higher) bourbon and the sugar needed to complete the recipe – but things we not so surprisingly had on hand. We excitedly opened the kit when it arrived, ready to get our bitters making on, when we read the instructions informing us that the process would take 21 days to complete. Bummer. But good things come to those who wait, right? The first part of the three-step process was infusing the bourbon. First, we cleaned the jars, and then toasted up the aromatics, which included cardamom, grains of paradise, cinnamon, cloves and gentian root, for one minute. 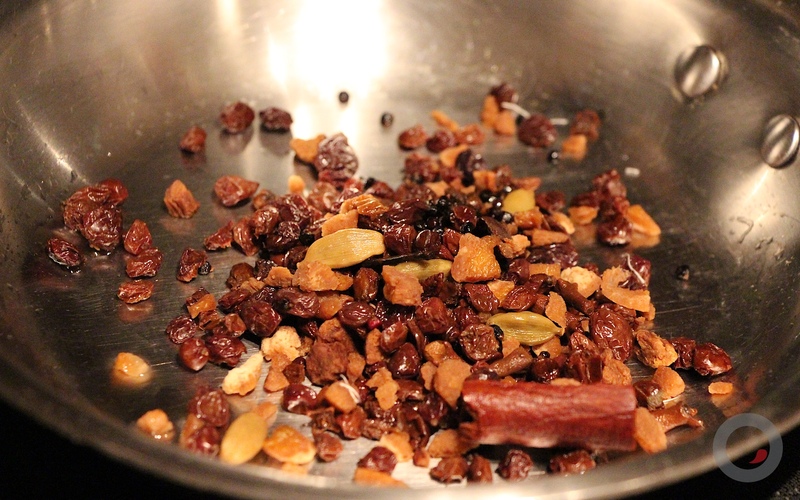 Then we combined them with ¾ cup of bourbon and some orange peel and let it sit in a dark spot. Fast-forward two weeks and it was time to strain the mixture. To do this we held the cheesecloth over a measuring glass and slowly poured the infusion in. 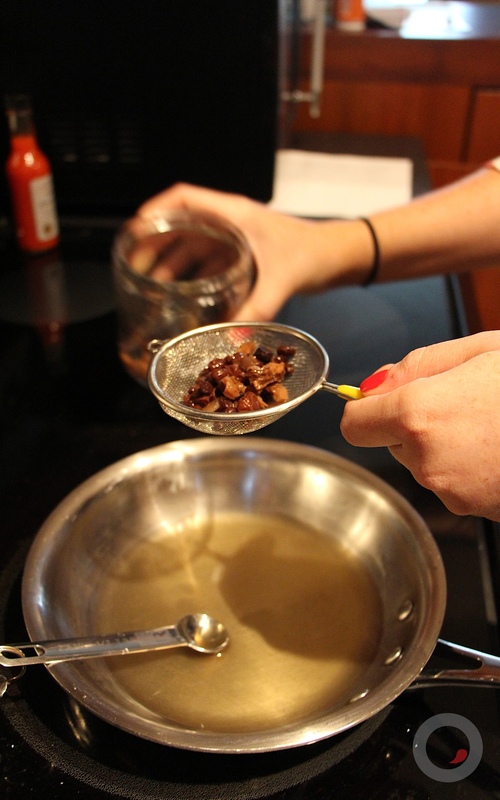 Once poured in, we gathered up the cheesecloth and squeezed the remaining liquid from the aromatics. 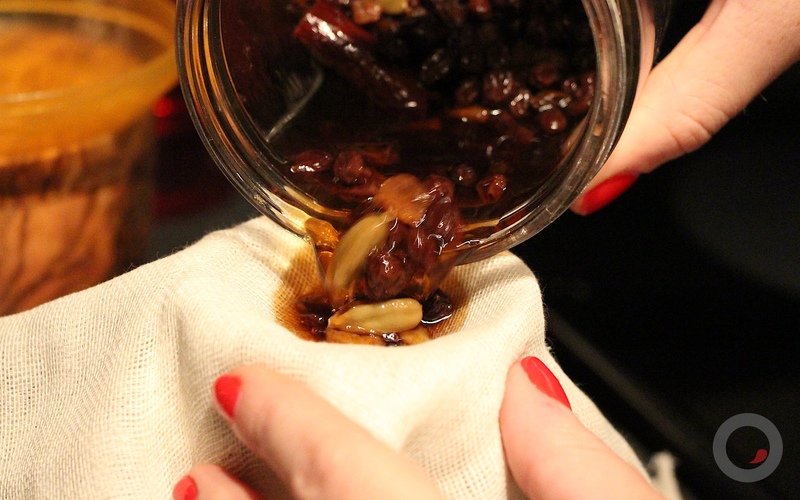 We then put that strained liquid in the amber jar and set aside. Next we put the leftover aromatics in a pan with ¾ cup of water and brought to a simmer for six minutes then took it off the heat to let it cool. 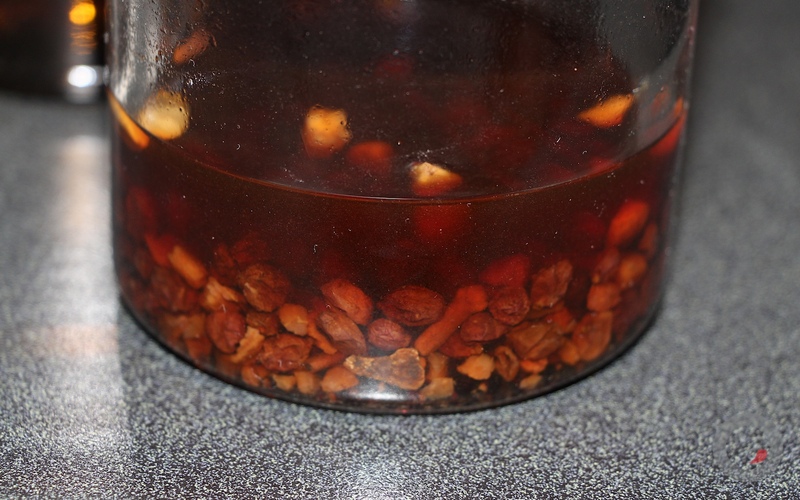 That mixture then went into the clear jar and both went back to their dark hiding place for another week. Seven days later, it was time for the last step. We strained the liquid from the clear jar through the cheesecloth to make sure we removed any solids, added it to a saucepan with ½ tsp of sugar and brought the mixture up to medium high heat while the sugar dissolved. We then combined that mixture with the mixture from the amber jar, and funneled it into the two bitters jars provided to us – and voilà! We finally had our bitters. Clearly it was only right to taste test them during a bourbon filled night at a popular local food bloggers residence. Everyone unanimously agreed that the taste was right on par with bitters one would find at your local bar and it really did help the spirits shine. Feeling in the DIY mood? Then check out Dash Bitters and pick up a kit for yourself – and make sure to invite us over to the cocktail party that will ensue. Cheers!